This tray is both durable and useful. Its two inch rims keeps your items from hitting the floor. I love to use mine to add a bit of class to those times when the hubby is served breakfast in bed – a good size. This Bamboo Serving Tray is not only gorgeous but it is made from a sustainable, eco-friendly and rapidly renewable resource. If for any reason this product does not meet your expectation, the company will send you a new one for free at their cost; No questions asked. The SB Trays Bamboo Serving Tray w/ Handles has the style, durability and features you want! 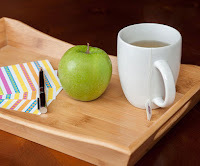 SB Trays: Stylish, practical serving solutions for your home! 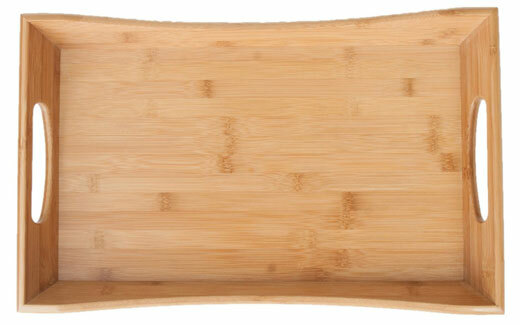 Attractive bamboo tray matches any decor - useful as serveware in the kitchen or dining room or as a decorative accessory on ottomans or a sofa table. A favorite among small platters. Easy to carry with convenient handles - perfect for carrying dishes or other dinner or beverage supplies for outdoor eating. 16.9 in. x 10.6 x 2.1 in. Made from durable, sustainable bamboo - the natural look and durability of wood, but a more eco-friendly choice than wooden trays!